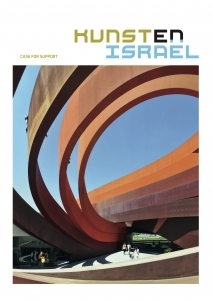 We are working hard to put Israeli art prominently on the Dutch map and to provide it with an international podium. Using art as an instrument for building bridges and fostering understanding, we give the Dutch population a glimpse of a complex land through the discerning eyes of its artists. An important part of our success is that we are independent – we receive no funding from the Israeli government – and have no religious or political affiliation. We do this work with a small team of two professionals and a large team of volunteers; nevertheless it all costs money. Our English-language Case for Support tells our story in such a way that the relevance of our work and mission here in the Netherlands, even for those outside the country, is clear and motivating. Read it here.